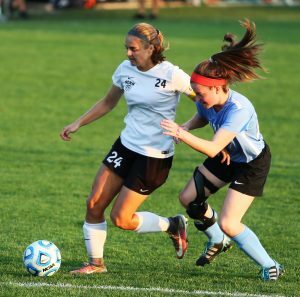 Defending State Champion Penn Girls Soccer started its run at a repeat by defeating South Bend Adams, 6-0, in Class 3-A Sectional action on Thursday, Oct. 5. Allie Lankowicz and the Kingsmen struck quickly. Lankowicz scored off an assist from Maya Locognato in the fourth minute to put the Kingsmen up 1-0. Kristina Lynch would get a hat trick in a seven-minute span to put the Kingsmen up 4-0 by the 25th minute. Molly McLaughlin had all three assists in Lynch’s scoring flurry. Mary Kaczynski scored on an assist from Maya Locognato in the 36th minute to put the Kingsmen up 5-0. Lauren Cernak scored of an assist from Kristina Lynch in the 47th minute to give the Kingsmen their final 6-0 margin.